It’s not easy ranking well in Google when you launch a new site. You see other sites in your niche ranking valuable keywords, and you think “This is going to be an uphill battle”. And that’s because it is. But today I’ll show you how to level the playing field. Here’s my 2-step SEO keyword strategy for new sites. What Does Your New Site Having Going For It? We’re going to start by understanding why it’s so tough for new sites to rank in Google. With no backlinks, your site has low domain authority. And this makes it tough to rank. Because other sites in your niche with strong domain authority are going to shoot up the search ranks before you will. You have little site architecture. As you construct your site over time, Google and other search engines will start to recognize what your site does. AKA how you add value to their searchers. But you’re not there yet. And it’s holding you back from ranking. So with these basic points in mind, let’s shift focus. Because it’s time to learn a new SEO keyword strategy. Job number one is to start creating content. This is how you’re going to build authority in your niche. Because having a homepage is great. And having products and solutions pages are great. But odds are your not getting much organic visibility on them. So, to break through onto page one, start writing content within your niche. Get your blog on a CMS like WordPress. This is going to streamline your content publishing process. Next, find out what other blogs in your niche are writing about. 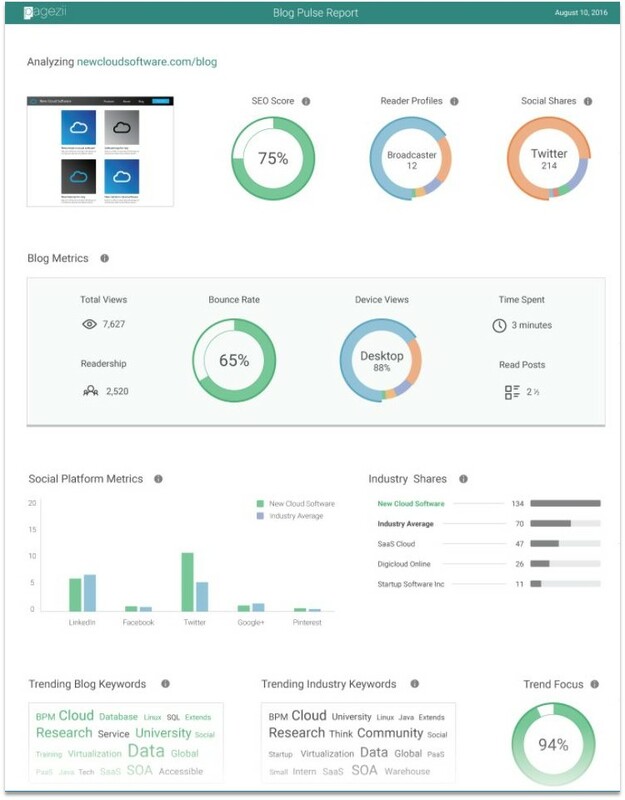 Look at their topics, share counts, SEO performance, etc. You can use Pagezii for this. To give you an idea, test-drive our Blog Analyzer. And then, start writing. And while you write, analyze your content at the same time. Otherwise, you’re throwing darts in the dark. Next up is the crux of your SEO keyword strategy – keyword targeting. Use your blog to target long-tail keywords. Because this style of the keyword is easier to rank for. I did the digging and found out users were actually searching for this query. Sidenote: When I’m looking for new topics to blog about, I usually consult my existing search analytics. It’s a treasure trove of data. And you can see why. Just have a look at the bold text in the description lines. And these two posts are a great example of targeting long-tail keywords vs. short tail. 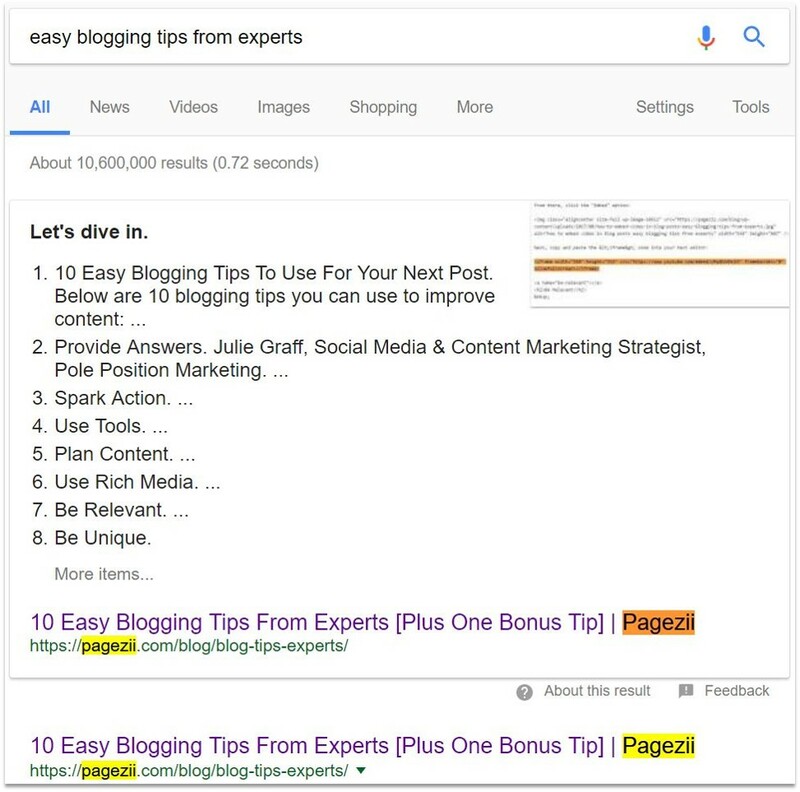 You can see above that “easy blogging tips from experts” shows a hard ranking difficulty. And while it is tough to rank for this keyword, other domains in the top search results don’t hold as much authority. You’ll notice ranking difficulty of “very hard” for this short-tail keyword. Ranking in a top position for this keyword is almost impossible. Because A) it’s a popular search, which means there’s a ton of competition. And B) the competitor is stiff. Sites ranking in top positions have strong domain authority. When choosing keywords to blog about, go with keywords you know you can rank for. And make sure to use Pagezii’s free keyword analysis tool, the SEO Keyword Analyzer as your co-pilot. It’s an awesome resource for navigating the keyword research landscape. 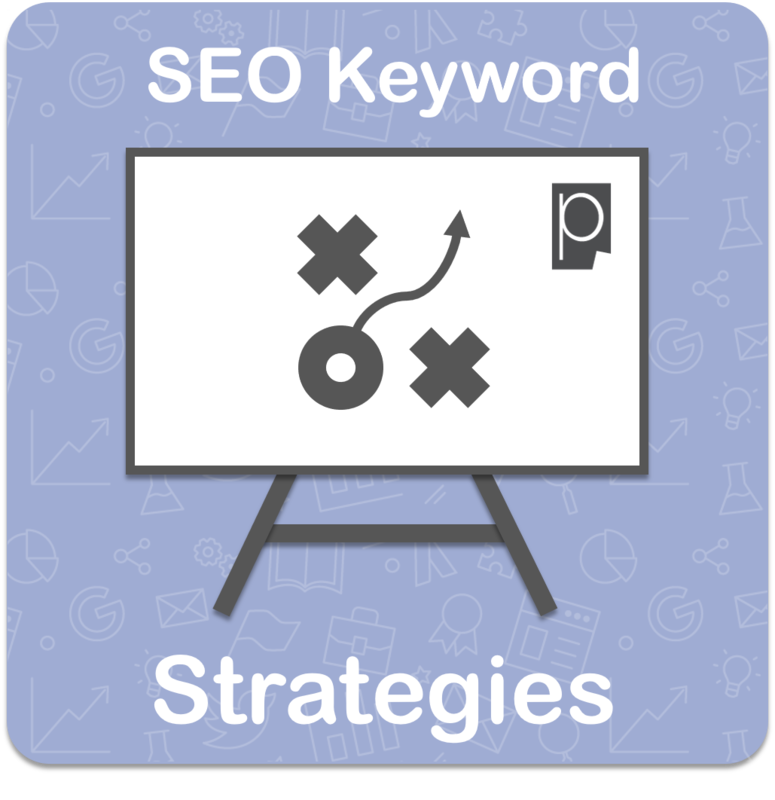 You now have a 2-step SEO keyword strategy to jump-start organic traffic to your site. I also laid out a few tools you can lean on throughout the process. So make sure to bookmark them. And to finish things off, I’ll share a few tips you can use to inject a bit of nitrous into your SEO keyword strategy. Focus on keywords within your niche: When you’re targeting new keywords in your content development process, make sure they’re relevant to what you do. If you’re startup CRM software, then theirs no need to create content on talent management, for example. Because these topics are unrelated. Work with other content writers: After homing in on your target keywords and writing content, ask other players in your niche to contribute. You can start out small, with local players interested in contributing. Then, step up your game – move to a platform like HARO. Why do this? Because when you include guest contributions, you’ll get more shares, more pageviews, and more clout. All of which are going to boost your domain authority indirectly. Pagezii’s SEO Keyword Analyzer – for keyword ranking difficulty scores and competitor rank tracking. Google Search Console Search Analytics – to discover unique keywords triggering content. This is REALLY a great tool for any SEO keyword strategy. Because it can help you find keywords related to your niche. Keywords Everywhere Chrome Extension – is awesome for scoping out average search volumes and competition levels for keywords. And the best part? You can do it on the fly. It takes Google keyword planner data and drops it right under the search bar in Google. LSIGraph – will help you come up with LSI keywords. These are keywords that are related to your target keywords. Because Google is so smart at detecting valuable content, LSI keywords are important to use throughout your blog posts and landing pages. They build context around what your page is about. And Google uses that information in it’s ranking algorithm. Now, it’s time to start ranking. Take the two-step SEO keyword strategy and these awesome tools, and get to work. Start driving organic traffic to your site today. And by the way – what do you think of my two-step process? Let me know in the comments below.